Feb 10: Hailing from Shreveport, LA, today’s black history month honoree is none other than Evelyn Ashford. The National Track and Filed Hall of Famer and UCLA graduate (Go Bruins!) claimed World Cup and World Championship titles, won Olympic medals, broke records and is considered one of the best track and field athletes of all-time. Ashford, a sprinter, dominated in the 100m. She made her Olympic debut in 1976 as a 19-year-old where she finished 5th in the 100m. 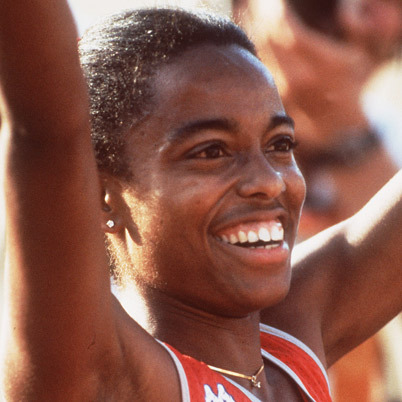 She was a favorite to win medals in the 1980 Olympics after she beat the 100m and 200m world record holders in 1979; however, the US boycotted those games, so Ashford was unable to compete. In 1983, Ashford set her first world record in the 100m when she ran 10.79s. The next year she claimed her first Olympic medal when she won the 100m in a time of 10.97s, becoming the first woman to break the 11.00s barrier at the Olympics. She won her second medal when she was the anchor leg of the 4x100m team that claimed gold in the same games. Later in 1984 Ashford bettered her own world record time when she ran the 100m in 10.76s. In the 1988 Olympics in Seoul she placed second to Florence Griffith-Joyner in the 100m, but she claimed gold as a member of the 4x100m team. At the age of 35, making her final Olympic appearance, Ashford claimed her third straight gold medal in the 4x100m race at the Barcelona games. Ashford was inducted into the Olympic Hall of Fame in 2005. For a career of excellence that spanned over 20 years, Evelyn Ashford should be remembered as one of the greatest athletes of all-time.